Last call for savings available at U.S. Ann Taylor Stores and Ann Taylor online. 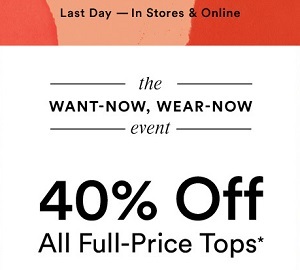 Take 40% off full priced tops. To receive the offer online, code WEARNOW must be entered during checkout. Offer is valid until July 11, 2017, 3:00 AM EST. For more details about the offer visit any U.S. Ann Taylor Store or Ann Taylor online.